Famous in Germany and much-loved in Australia, everyone will love your homemade schnitzel. Schnitzel means "cutlet" in German, but it is universally known as a piece of thinly pounded meat dipped in egg, breaded and then fried - so simple yet so delicious. Don’t forget to read all the steps before cooking; you’ll thank us after. Note: You need an egg from your pantry for this recipe. Wash the fresh produce. Thinly slice the red cabbage. Grate the carrot and apple. Thinly slice celery and spring onion. Pat dry the chicken with paper towel. Place the chicken on a clean work bench. Hold a sharp knife along the side of the chicken. Using a sawing motion, slice through each chicken breast. In a shallow bowl, whisk together egg and mustard. Spread bread crumbs on a large plate. Spread flour on a separate large plate and season with salt and pepper. Add chicken to flour, turn to coat, then shake off excess. Add to egg mixture, turn to coat, then allow excess to drip off. Add to panko bread crumbs and turn to coat completely, pressing to adhere. Shake off excess. Heat olive oil in a large pan over medium heat. When oil is shimmering, add chicken and cook until crust is browned and chicken is cooked through. Cook in batches if required. Transfer to a paper towel-lined plate to drain. To make the slaw, in a medium bowl, combine red cabbage, celery, carrot, apple, and spring onion. Stir through yoghurt. Season with salt and pepper to taste. 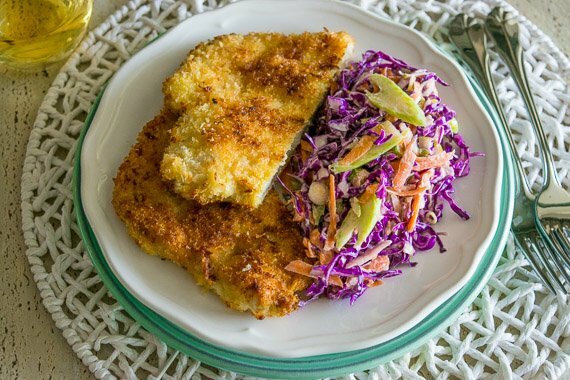 Divide chicken and slaw evenly between plates. Enjoy!